Several gunmen on Friday evening attacked a busy shopping mall in Munich, spraying bullets as people ran fled in horror for safety from what police said was a terrorist attack. Police said six people had been killed and the attackers were still at large. They told the public to get off the streets as the city - Germany's third biggest - went into lockdown, with transport halted and highways sealed off. As special forces rushed to the scene, some people remained holed up in the Olympia shopping center. "Many shots were fired, I can't say how many but it's been a lot," said a shop worker hiding in a store room inside the mall. The woman, who asked not to be identified, said she had seen a shooting victim on the floor who appeared to be dead or dying. 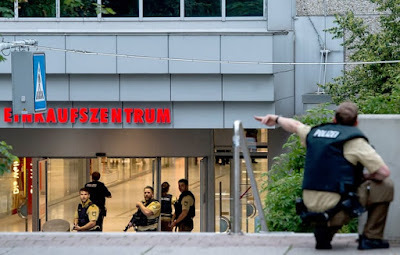 A worker at a different shop, Harun Balta, said: "We are still stuck inside the mall without any information, we're waiting for the police to rescue us."